The Autograph 75-4 features as standard a Peugeot Euro 6, 2 litre 160 bhp engine. 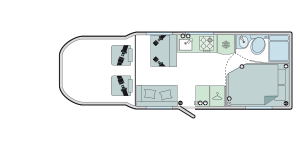 It has Alde central heating, solar panel, reversing camera, external 240v socket and BBQ point, large fridge with freezer compartment, Combi oven/grill and dual fuel hob, 4 belted traveling seats and a separate shower cubicle within the washroom. Please enquire for warranty details.